WiX Tricks: I love that logo. Wow, right there on the top of the front page of MSDN, "above the fold". I especially love what someone (I don't know who) did with the WiX logo. Melody Fosmore (Jenny's aunt) created the original WiX toolset logo for us and I think it looks great on that top hat. I also get a kick out of the header "WiX Tricks". 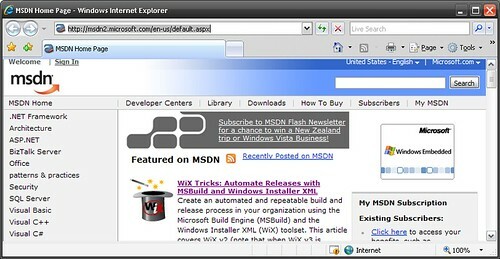 I wonder if there is enough interest in the "WiX Tricks" if MSDN Magazine would consider publishing more articles under the "WiX Tricks" banner. Hmm, now that would be totally cool.